Meanwhile, in the City of Westminster . . .
Is David Cameron the luckiest man alive, or what ? Saved by Hoon & Hewitt in an important week when he was looking like a prize eejit. C@W has long registered misgivings about the boy Osborne, and it is surely clear now that his ability to muster (and brief his master upon) a coherent Treasury package is wholly inadequate. Not a comfortable conclusion. "Wednesday's revolt was more significant than it may look"
"There's still a small chance that Mr Brown may still go before the election"
In the meantime, let us fervently hope that the nation doers not need the services of a serious Foreign Secretary, because we're in the hands of one of the most over-rated, pusillanimous specimens ever to occupy that Great Office. The bookies must be wiping his name off their boards as I write. Did I half catch a headline on the news about Darling announcing very tough budget cuts? Was that his price for not shoving Brown out of the door? 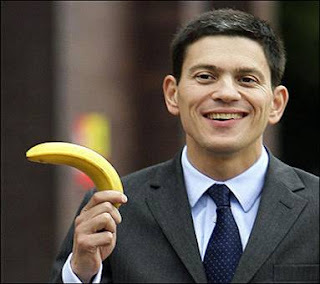 If so three cheers to the man and perhaps he will be the next PM. We refer the hon gent to the response we made a few posts ago. No doubt he made a deal. .. not be surprised to see some firmer economic statements from Darling and more credible announcements on public sector debt. Yes some are now saying that Darling and Mandleson have imposed a more realistic economic policy on the accident prone Brown and the self-regarding Balls but ... hasn't this happened before - and hasn't Brown reverted to form within a few weeks? I seem to remember a surprisingly tough pronouncement last summer only to find Brown back-pedaling at the Labour Conference. I agree with Budgie, the rebels think they have the upper hand now, but when Brown announces loony policies with just a few weeks to go until an election..what then? The PM has the power to call their bluff. They have won a victory in their own minds only; Brown is a psycopath you would have thought they had twigged it by now. The Tories are not doing much at the moment, if it were football they would be coasting with only a one nil lead; very dangerous place to be.